Reports have emerged regarding the existence of a lower-end variant of Nvidia’s low-end GT 1030 graphics card. It’s said that several graphics card manufacturers have been listing DDR4-based custom GT 1030 graphics card on their respective official websites. 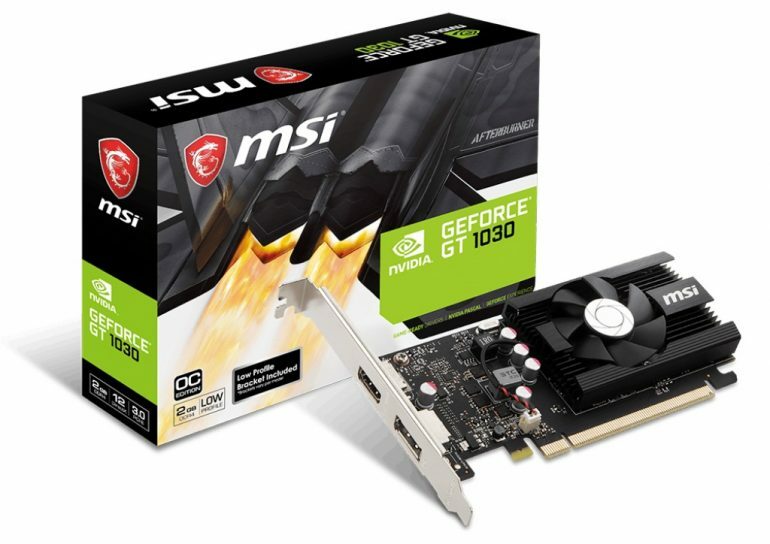 To be more specific, the manufacturers in question are MSI, Palit, and Gigabyte. For those who may remember, at launch, the Nvidia GT 1030 graphics card featured 2GB of GDDR5 memory (3GHz), which ran at 6008MHz. The “new” DDR4-based GT 1030, on the other hand, now comes with a significantly reduced memory clock speed of just 2100MHz. In addition, the revised GT 1030 graphics card may also theoretically only have 16GBps of memory bandwidth; the reference GT 1030 had a memory bandwidth of 48GBps. Some consumers may have concerns on differentiating between the GDDR5 GT 1030 variant and the DDR4-based one. Manufacturers like MSI and Gigabyte have made this somewhat easier. Their custom DDR4-based GT 1030 graphics cards come with the “D4” nomenclature. That said, graphics card makers like Palit, however, did not explicitly mention that its custom GT 1030 is based on the DDR4 memory controller – so consumers need to be wary of that. Those aside, the reasoning behind releasing a slower version of the already slow GT 1030 graphics card remains unclear.